Can I change which selectable credit card types will display during checkout? 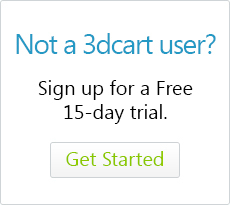 By default, your 3dcart store will have the 4 major credit cards listed for use during checkout. These are Visa, American Express, Mastercard and Discover. However, you may want to add or otherwise delete a specific card for business reasons. For example, your credit card gateway provider may charge a higher rate on a specific card provider and you'd like to remove this card type as a displayed option altogether. You can easily specify which cards you display during checkout by going to the "Credit Card Types" section of your 3dcart Online Store Manager and setting your card preferences there. The following instructions will only remove the credit card type as an option on your cart's checkout pages.This is so that the credit card doesn't display for the shopper - thus discouraging them from using the card in the first place. However, please be aware that some payment gateways may still process a card regardless of which credit card type is selected. In other words, depending on your credit card processor, it may be possible to select "Visa" from the drop down menu, while using a Discover Card and still have the order go through. If there is a specific card type you're trying to reject altogether, please be sure to check with your credit card gateway/merchant provider to see if they may have a way to effectively block the card type completely. Click on the link labeled "Edit Credit Card Types"
Once there, you'll see the cards that your site is currently set to "accept" in the card selection drop down menu. If you'd like to remove a card type option, simply click on the "Delete" link beneath it and confirm your action. If you'd like to add a new card type, look to the top right of the page and click on the "+Add" button. Enter the name of the issuing card provider and click "+Add" beneath the name to add it to your list. If you'd like to change the caption/name of an already added card type, simply change the name as it appears in the field and click on the "Update" button found along the top right of the page.